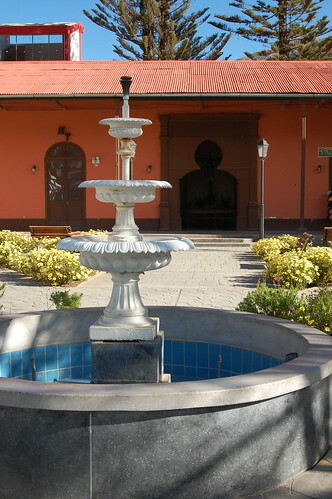 Even though Tarma is a pleasant enough city, filled with blooming flowers during much of the year, most visitors actually use Tarma as a base to explore different parts of the Junín region. I was no different; I wanted to make the most of my brief stay. Despite all the travel I’d already done in Peru, I had yet to visit the Amazon, not even the high jungle only a few hours away from Cuzco or Huánuco. For this reason, I opted to take the tour of the central jungle and get a sense for the cultural and climatic differences just a few hours away. As it turns out, this was an excellent choice and one that helped mold my decision making as I moved onto northern Peru and Ecuador later in my travels. For one, heading into the jungle meant getting out of the cool, dry winter weather in the central Andes, even just for a couple of hours. Beyond that, descending into the Valle de Chanchamayo gave me a glimpse into yet another facet of Peru. Our first stop on the tour was this crossroads you see in the photos above. Because of the way the mountain ridges curve and cross in the landscape, there is a surprisingly strong, powerful wind that rolls off the hills and is said to cleanse you. Naturally, this is an ideal time to take some pictures, but I have to admit I was more fascinated by the way the mountains had started to tower above us. Nearby, there is a small stand selling artisan treats, including small batches of manjar blanco (milk caramel, otherwise known as dulce de leche) and preserves, which were delicious. 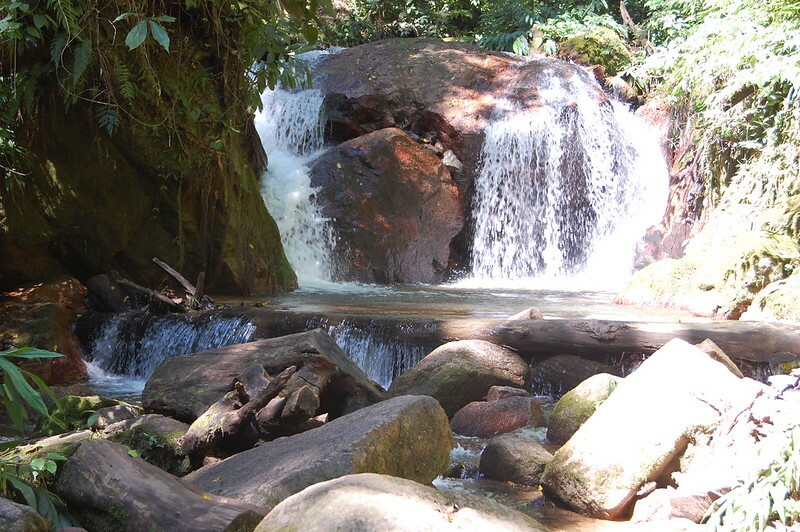 You know that you are starting to get into the more tropical climate as you begin to spot the waterfalls cascading off the hills all around you. 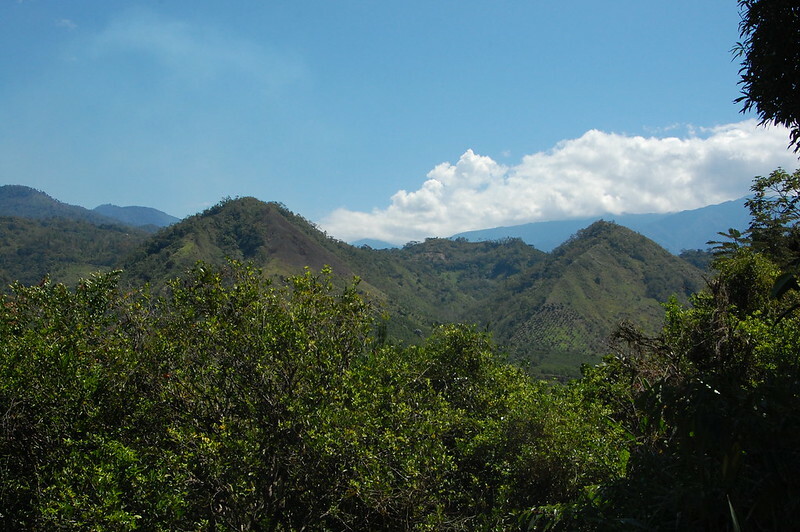 In quick succession, we saw the Cabello del Angel (Angel’s Hair) followed by the Ducha de Diablo (The Devil’s Shower), two waterfalls named for their appearance as well as their danger. Soon, we had the opportunity to get out of the tour van and appreciate what used to be the highway in these parts, a narrow road carved along the rock walls of this particularly canyon, closely following the rushing river below. This also gives you the opportunity to appreciate how modern construction has made life a little easier and transportation between the two regions much more efficient as well as safer! 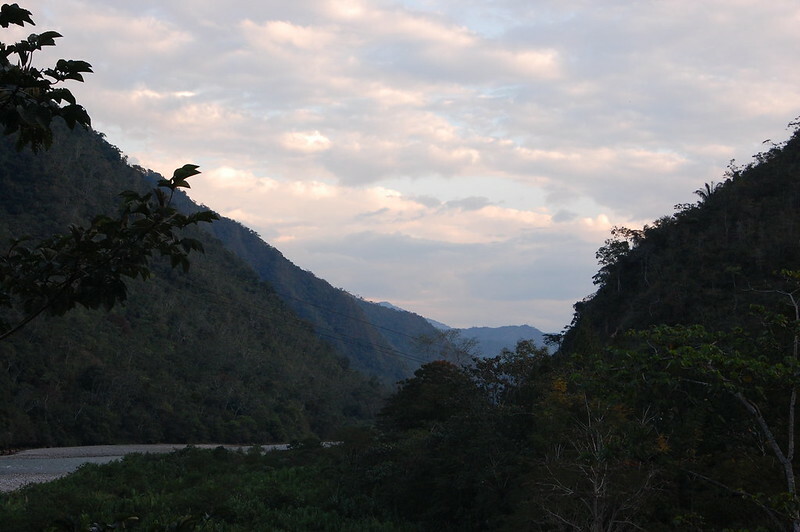 Arriving in San Ramón, the landscape clearly demonstrates why the Valle de Chanchamayo is a perfect climate for growing so many of the products the high Amazon is known for. Check out those green peaks – quite different than the toasted mountains of Huancayo I’d been hiking around just a week before! Now it was time to really appreciate the humid, verdant climate and head into the jungle in search of the Catarata de Tirol, the powerful waterfall you see to the right. P ersonally, I enjoyed watching all of the butterflies flying around us. 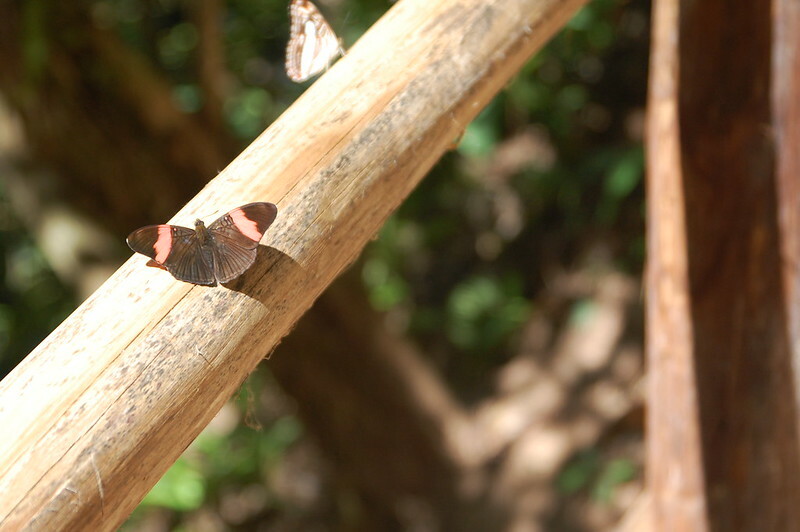 I befriended a cheerful child who was accompanying us on the tour, and he went out of his way to spot butterflies so that I could try to capture a shot of them. 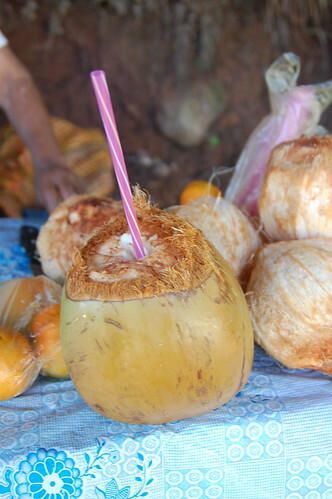 At the end of the walk, I couldn’t resist buying a fresh coconut. One of the things I most miss about Peru when I’m somewhere else is how readily accessible (and economical) all of the fruit from the jungle is. 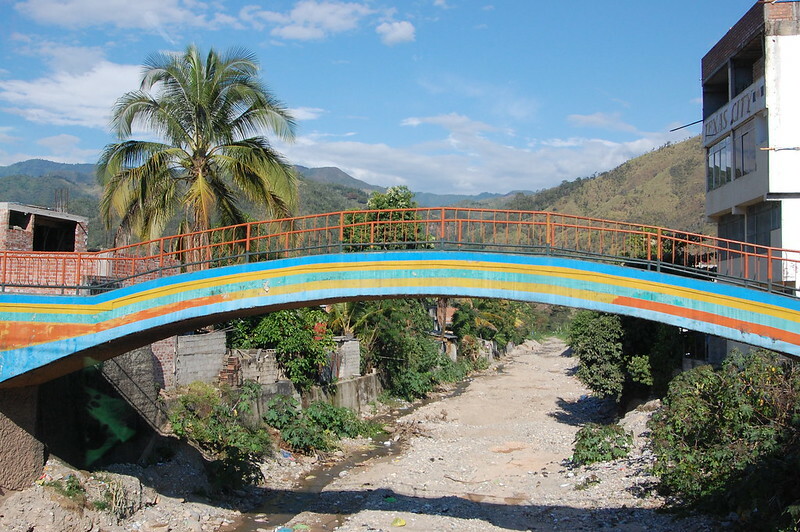 From there, we headed towards La Merced, stopping at the small tourist village that’s sprung up alongside Puente Colgante Kimiri. Although there wasn’t much to see, I appreciated this cheerful pedestrian bridge and wandering around looking at the stores before heading to lunch. 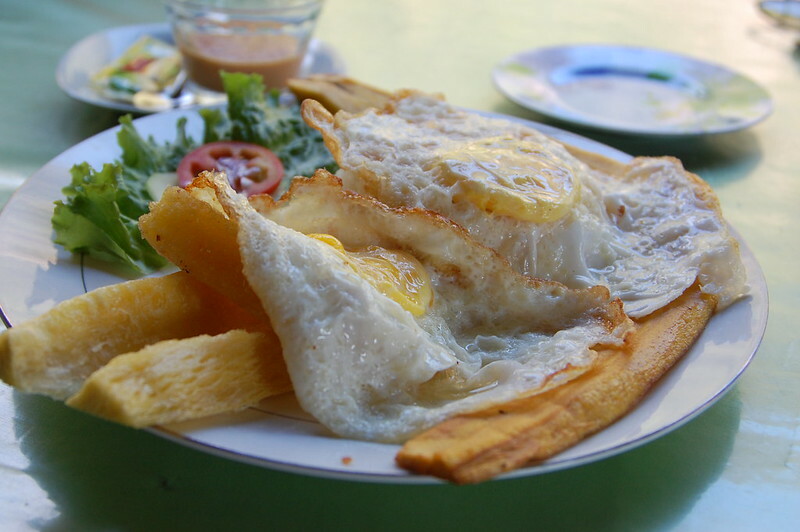 As with most tours popular among local tourists, a traditional meal of regional delicacies was in order, but as a vegetarian, my options were limited to arroz a la cubana, a common dish consisting of eggs, rice, and fried plantains, with the regional twist of fried yuca. Not bad for S/.5! 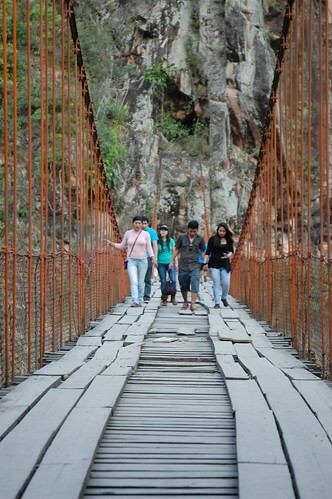 After lunch, we crossed the Puente Colgante Kimiri, an old wooden suspension bridge (built in 1901!) 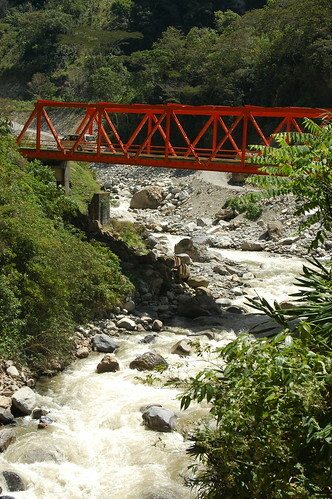 which connects the communities on both sides of the Chanchamayo River. 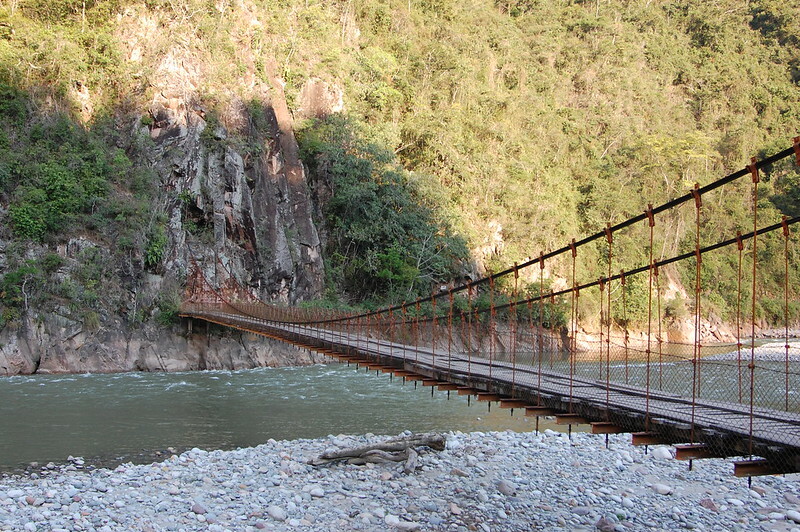 Believe it or not, cars cross over this rickety bridge, but I was too scared to do so myself! 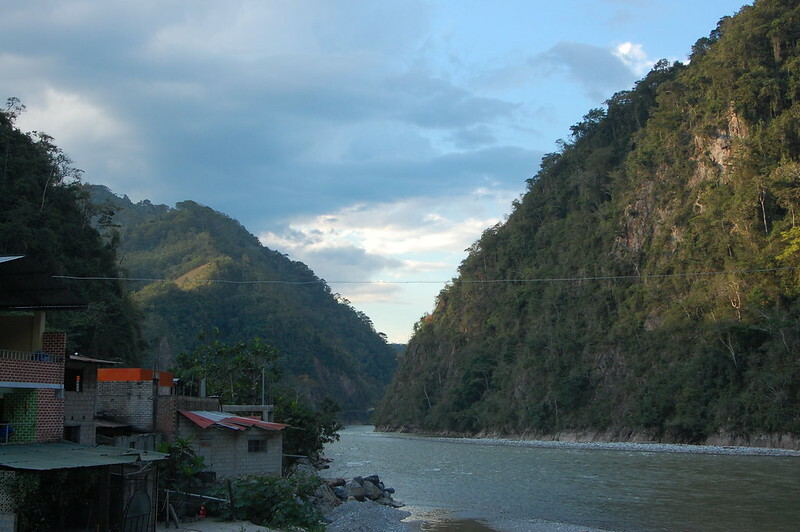 Instead, I took the opportunity to take some pictures of the views alongside the Río Chanchamayo as the sun began to dip down behind the mountains. I was fascinated by the cool trees. Continuing on, we passed the Nativo Dormido, or the Sleeping Native. According to legend, a young indigenous man saved a Spanish woman when she was wandering lost through the jungle and brought her to his community to help her. Naturally, they fell in love and promised the jungle god that they would get married before the full moon. The woman returned to her family, who punished her for wanting to marry a local and kept her from leaving. 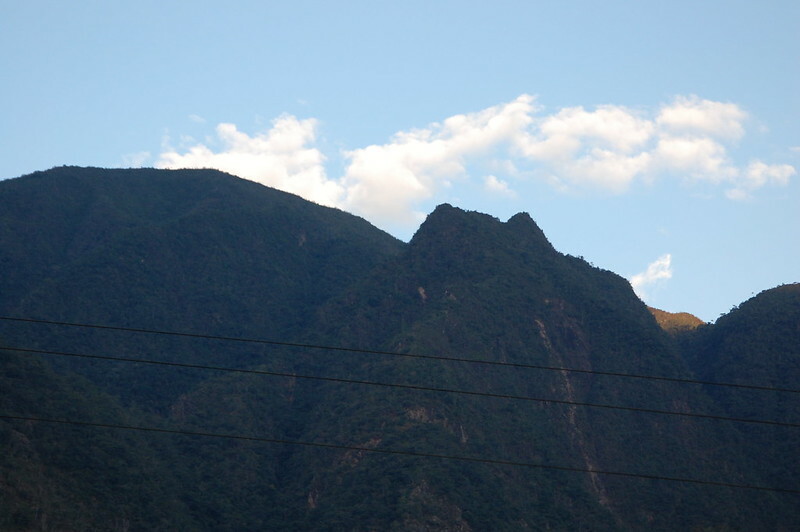 When she finally escaped, it was too late, and the jungle god turned the young man into the sleeping mountain you see here, and the woman into the Bella Durmiente (Sleeping Beauty) which can be seen near Tingo María, near Huánuco. At this point, the sunset grew quite lovely, but we still had quite a few stops before returning to Tarma. Be prepared: it’s a very long day and many hours in a van! The second to last stop is at one of the communities of the Asháninka tribe, who live in this area and have started to earn a significant income from sharing their traditional songs and dances with the many tourists who visit from Lima and around Peru. While my young friend assured me that community enjoys performing and sharing their culture, it felt a bit exploitative as we dressed up in traditional costumes and were invited to participate in the dances. Afterwards, you’re led by the children to purchase jewelry, the same jewelry you see everywhere throughout Peru. 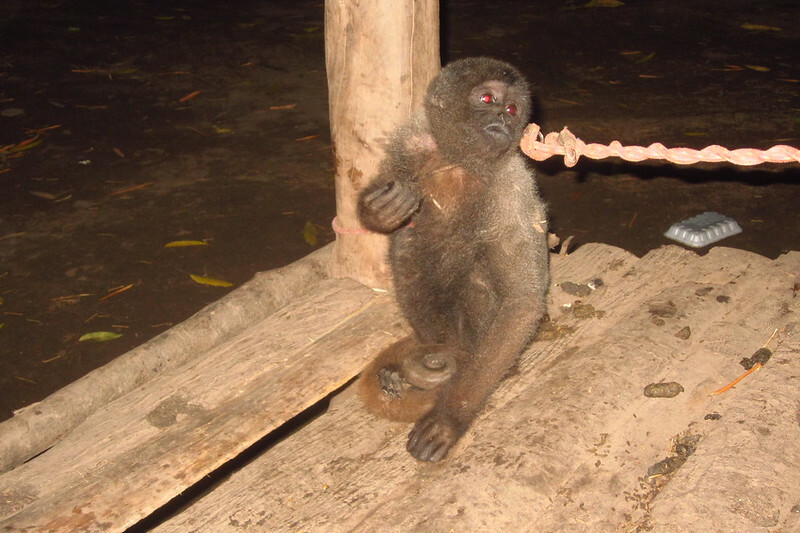 I chose just to share this photo of the monkey because I was uncomfortable with the experience. What can I say? Last but not least, you stop to try the regional products at huge warehouse filled with samples, Chanchamayo Highland Coffee. Tourists are funneled through the explanation of all of the regional specialities in a long, crowded line. The bright side is that the coffee and products sold her are organic and/or fair trade and support the local growers, which is something I can get behind. 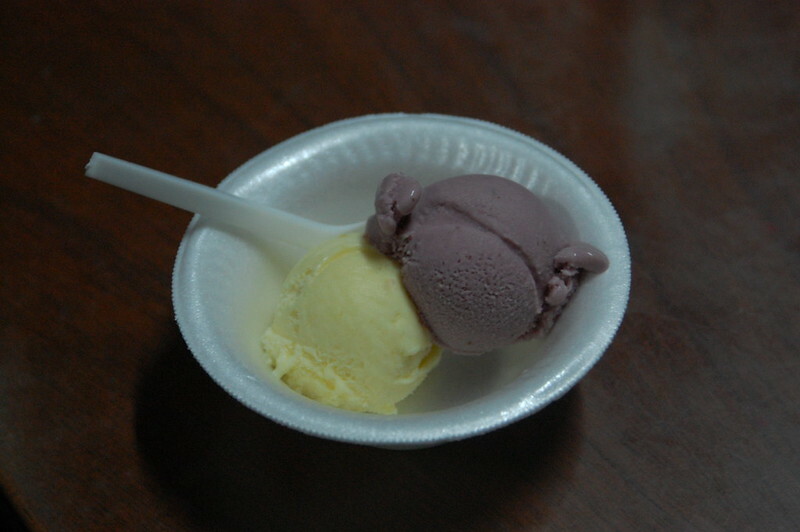 It was pretty cool to have the opportunity to try juices and liquors made from jungle fruits, but of course, I opted for ice cream. After our last stop at a small café, we hit the road for the drive back to Tarma. This ended up being a fun experience, as our tour guide explained more of the legends of the area. Someday I’d love to compile the legends of the Andes into English… a project to keep in mind for my next visit! The tour of the Valle de Chanchamayo was my last stop in Junín as well as central Peru, but it certainly piqued my interest in the unique culture and climate of the jungle. As I continued on to northern Peru and eventually Ecuador, I decided to spend more time in the high jungle and I still plan to head deeper into the Amazon within the next year or so. I’d say the tour was well worth it! For the latest photos from my travels in South America and in the US, be sure to follow me @blueskylimit on Instagram. The high jungle tour leaves from Tarma and on weekends there are usually several different agencies looking for tourists around the Plaza de Armas and trying to fill up their vans. This also means that they will leave whenever they have enough passengers, so the departure time they tell you should be regarded as just an estimate! The tour cost S/.50 in September 2013. You also have to pay a fee to enter the park at the Catarata del Tirol and are encouraged to tip the Asháninka community after their performance. I spent a total of S/.58 on this tour. You have several opportunities to purchase artisan food products, fair trade coffee, and jewelry and other souvenirs on the tour, so be sure to bring small change. The big coffee warehouse accepts credit cards. 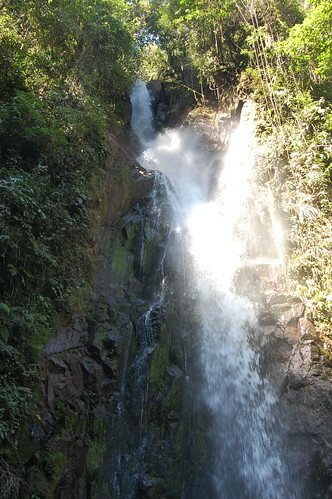 Be sure to bring your walking or hiking shoes and a swimsuit so that you can get drenched by the Catarata de Tirol. I suggest wearing layers as you will pass through several climates in only a matter of hours. Under normal circumstances, getting to Tarma is fairly straightforward. There are regular buses and colectivos (shared taxis/vans) to Tarma from Lima, which makes the five hour journey a perfect weekend escape. It’s also only a few hours from Huancayo, making it a logical stop before heading back to the capital. But me? I wanted to make things a little more complicated, and, let’s face it, a little more interesting. After leaving Huancayo, I headed to Huánuco to see the ruins of Kotosh. I’d been considering two potential routes onwards: heading into the jungle and making my way to Pucallpa, or heading back to the Cordillera Blanca to Huaraz. In the end, I did neither; I backtracked to Tarma! The thing about public transportation in Peru is that you can get just about anywhere. And if you travel short distances, there’s usually an easy and quick way around, as long as you’re willing to travel like the locals. And so it was. 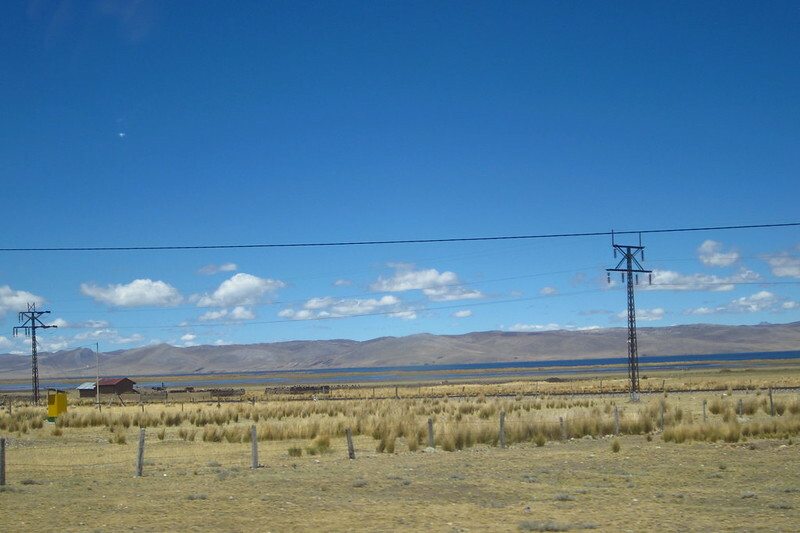 To get to Tarma, I ended up taking a colectivo from Huánuco to Cerro de Pasco. One of my biggest photographer regrets is that I did not have my camera easily accessible during this trip. Cerro de Pasco is one of the highest inhabited cities in the world; as a mining city, its buildings are purely functional and are toned in somber shades of grey and darker grey. I can still picture the houses clinging to the hillside as we headed into the city. Heading to Tarma from Cerro de Pasco was incredibly easy; I got out of one colectivo and directly into another. In the colectivo lot, drivers shout out their destinations and rush to fill their cars and get back on the roads. This part of the journey was even better. I was lucky to share the car with several friendly passengers, who were eager to talk to me about what the heck I was doing over here and share aspects of their culture with me. They pointed out the series of blue lakes that we whizzed past – there are some natural reserves over here and it definitely seemed worth exploring at a more leisurely pace. But my favorite part? As we drove past the town of Huayre, we slowed so that I could take a picture of this amazing monument. This statue honors maca, that Andean radish-like root vegetable that is known for its medicinal properties. It’s supposed to enhance your energy, athletic performance, and memory, as well as your, ahem, stamina, if you know what I mean. 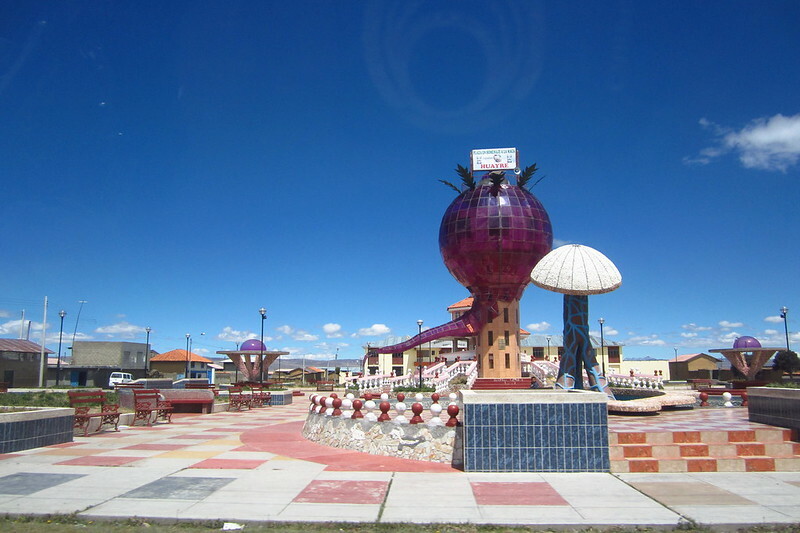 As you drive along the highway in Huayre, you have the opportunity to buy homebrewed drinks with maca. One of the passengers encouraged me to drink it, but it was way too chalk-like for me – so I gave the bottle of maca to him. I’ll stick to quinua, thank you very much! 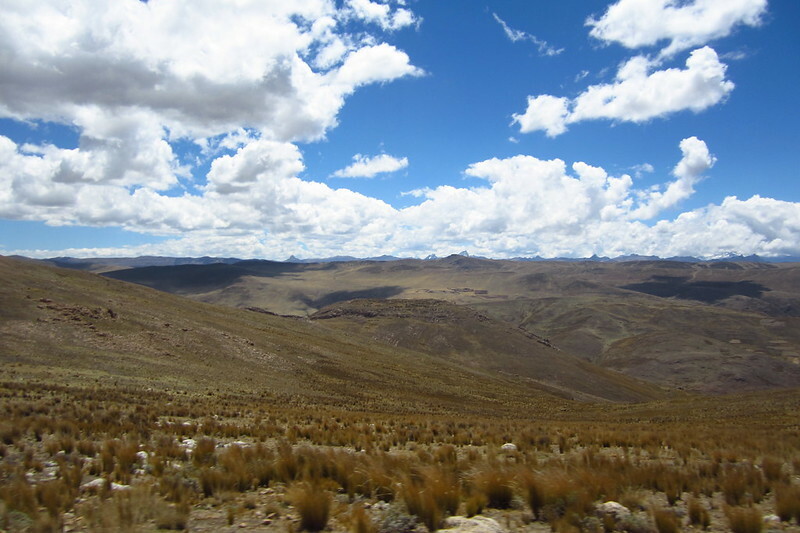 After coasting along the highway for a couple of hours, we ascended back into the beautiful hills of the Andes. In this section, we passed an out-of-the-way mine and saw very little besides this toasted landscape. And, well, these clouds. As an avid cloudspotter, I still can’t bellieve the way the clouds looked at this altitude. Dreamlike and gorgeous. 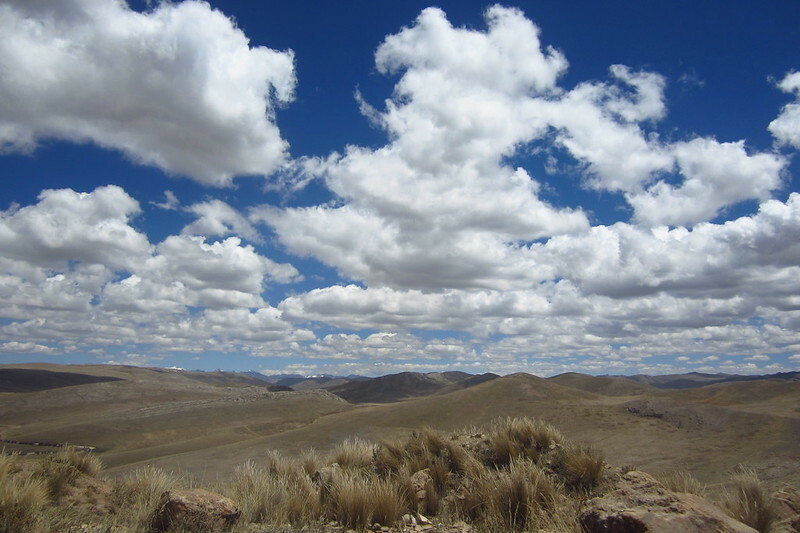 From there, we descended toward Tarma. Three years ago, the roads were under construction which made travel less-than-pleasant, but I’m sure the roads are much better now! Good thing we were descending into my ever-loved foothills. This route reminded me of visiting Matucana and Callahuanca, which is no surprise if you consider that they’re located more or less along the same stretch of the Andes. 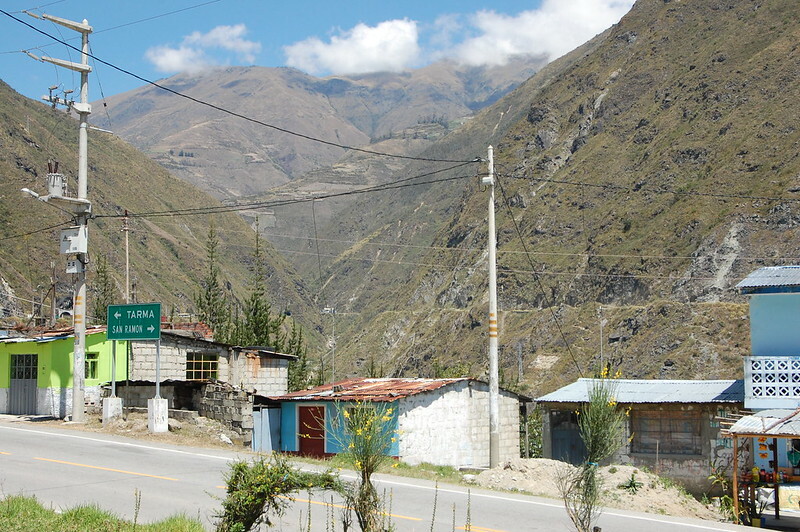 Finally, we arrived to Tarma, otherwise known as La Perla de los Andes, or the Pearl of the Andes. Tarma is known for its lovely climate, ideal for growing beautiful flowers. It’s one of the top destinations for Semana Santa (Easter Week) due to the beautiful carpets of flower arrangements that you can observe throughout the celebrations. Unfortunately for me, I arrived at the end of winter, which meant the flowers weren’t really in bloom yet. So I decided to make the most of my visit by getting to know the town as much as I could and venturing outside Tarma to other nearby destinations. 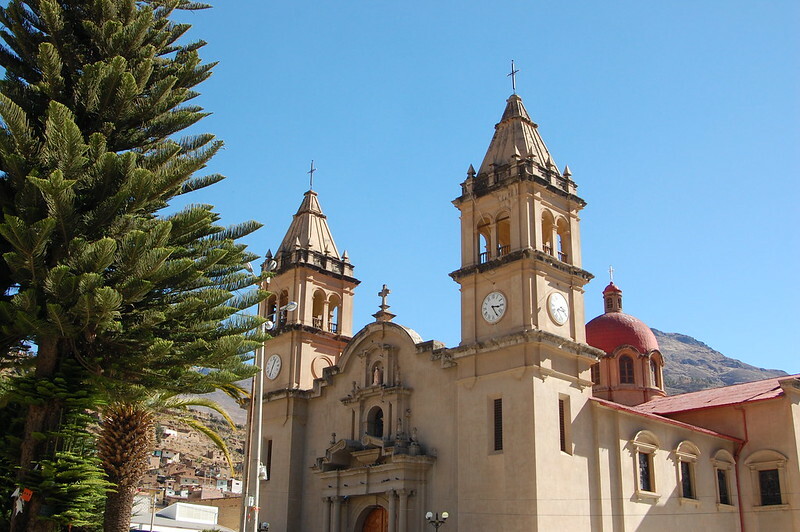 Tarma is an adorable little town because of its colonial architecture, including the church located on its main plaza. The city is easily accessible by foot, so you can wander through the streets, admiring the colonial balconies and the brightly painted walls. 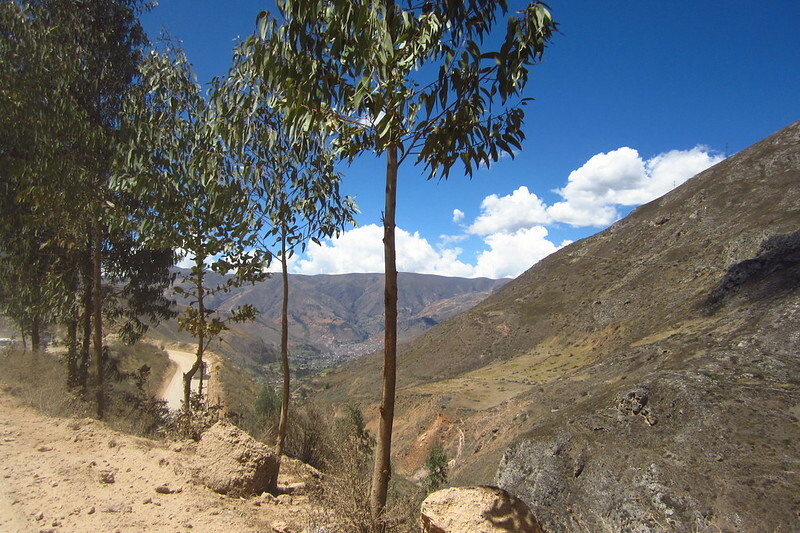 Tarma’s charm also lies in its views, which I found hard to capture with my photos. 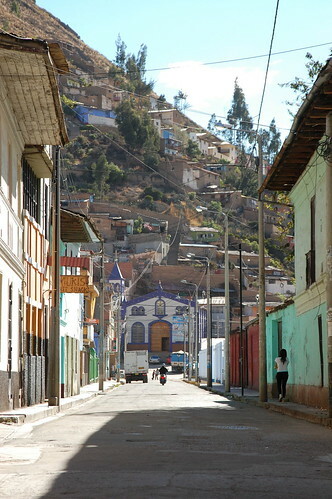 As you walk through the streets of town, you are surrounded on all sides by the foothills of the Andes. You can see the houses perched up above. As you can see, Tarma is a good place to get away and relax. Tarma is pretty quiet outside of long weekends and Semana Santa. If I had it to do all over again, I would have visited Tarma when I was living in Lima rather than as part of a more extended backpacking journey. I felt it was more of a place for a peaceful getaway, and after two lonely days in Huánuco, I was anxious to be in the company of other travelers again. The good news is that Tarma provides access to some very interesting journeys around the region – and after considering my options, I signed up for a tour of the high jungle the next day. 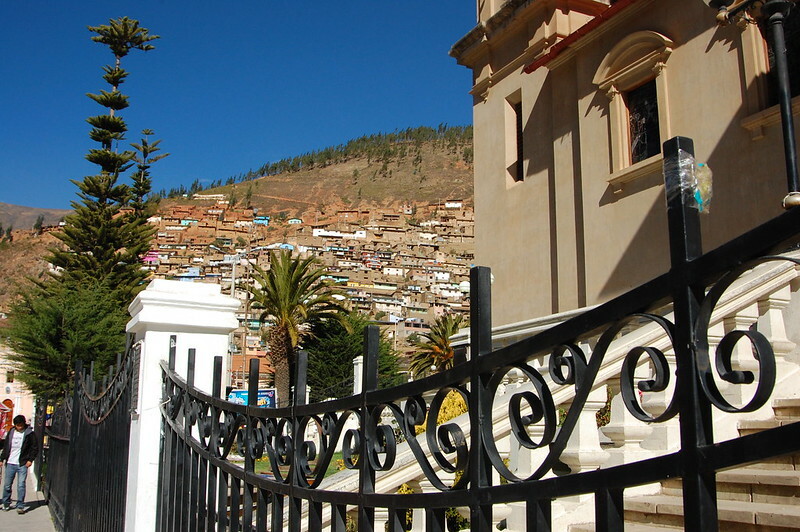 Tarma is located about 5-6 hours from Lima, and you can take a public bus or shared taxi/van (colectivo). 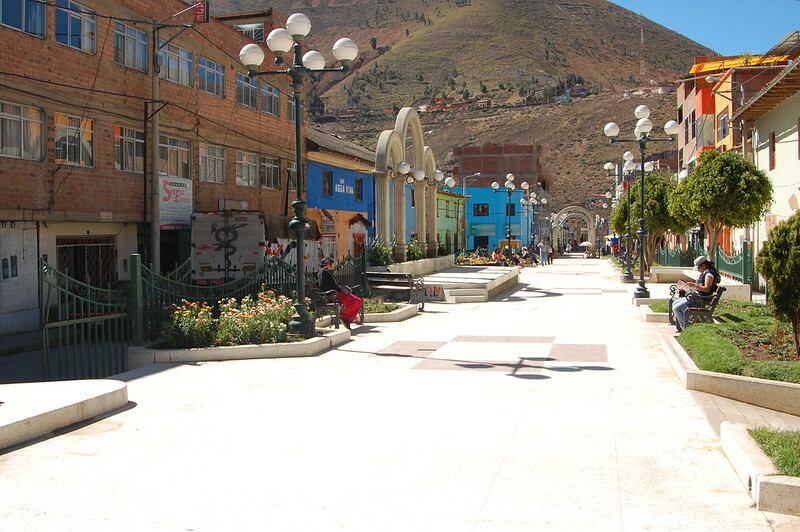 Tarma is about three hours from Huancayo. 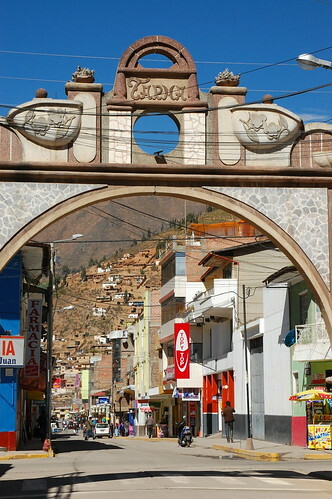 From other parts of the region (like Huánuco), you’ll want to take a bus or colectivo to Cerro de Pasco or La Oroya, where you can get another colectivo to Tarma. 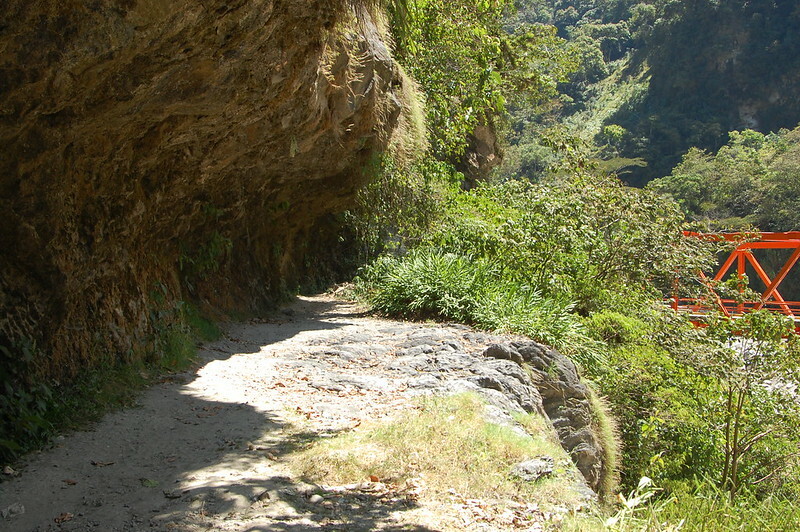 For locals, these routes are pretty standard and it’s easy to get around. There are a number of hostales in Tarma, and if you’re visiting in off-season, I suggest checking out a few to see which one suits you best. Keep in mind that you’re in the mountains, so nights can be quite chilly. The colonial buildings with their high ceilings might not be your best bet. As far as I know, there aren’t any hostels in Tarma and I didn’t see any other foreigners during my visit. 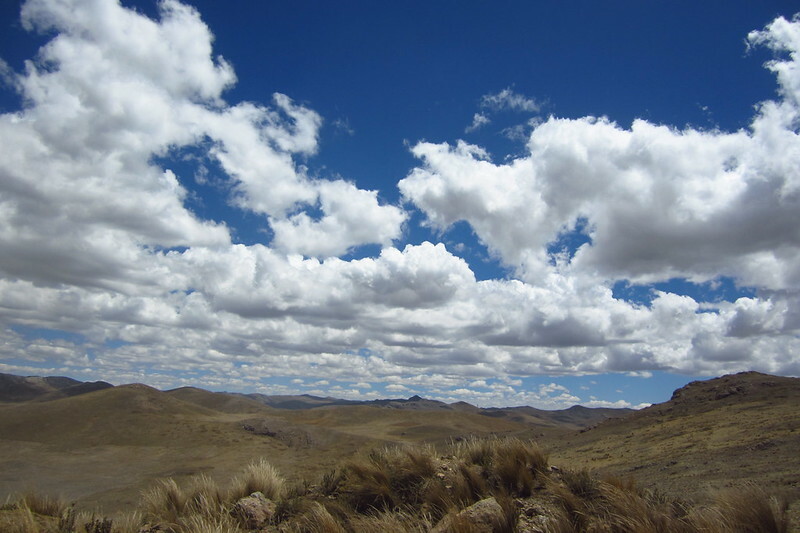 Wikitravel lists several options for exploring the area around Tarma. If you read Spanish, Y Tu Que Planes? has detailed suggestions for what you can do in Tarma. In general, there are three tours. 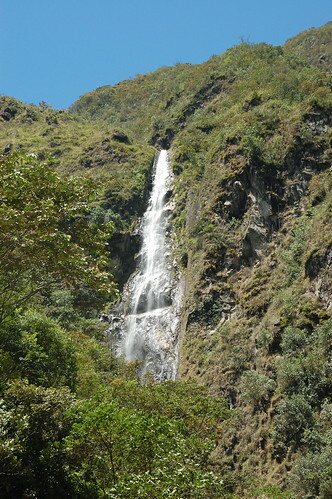 First, there’s the Valle de las Flores tour, which takes you to Acobamba, to see a religious icon, Palcamayo for the Gruta de Huagapo, a giant cave, and San Pedro de Cajas, for textiles. 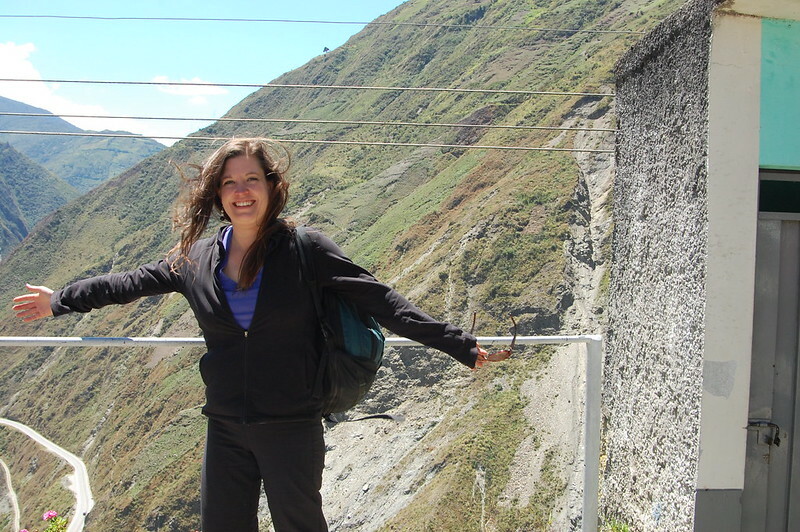 Second, there’s a tour that takes you along the Inca Trail (Camino de Inca) which passes through this region (and you can also visit some ruins, of course!). 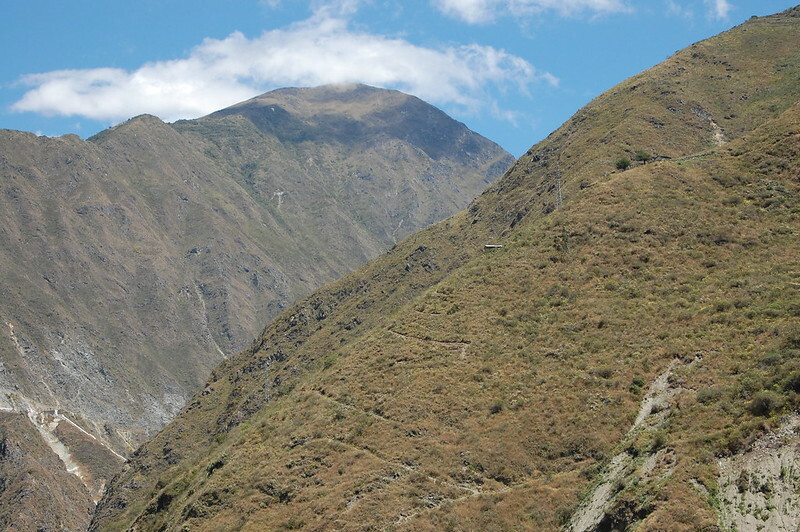 Third, there’s the tour to the Valle de Chanchamayo, heading into the high jungle within easy reach of Tarma. I opted for the latter for a change of pace.